Download source code associated with this article here- MSGraphSDKConsoleApp. In this article, I will explain you how you can write your first program to interact with MS Graph API using MS Graph SDK in Visual Studio. Microsoft Graph API is a powerful way to interact with Office 365 data. MS Graph API gives you a single REST API endpoint which you can call to interact with “almost anything” in Office 365. Read my article here to know more about MS Graph API. If you want to follow the steps mentioned here, then there are some prerequisites which you must have, otherwise you can continue reading. Don’t have VS 2017? Download free “Visual Studio Community 2017” here. Read my article how to install VS2017 here. Don’t have Office 365 subscription? Read my article here about how to get 1-year free Office 365 developer subscription. Even if you have Office 365 account from your employer, I strongly suggest not to use it for development purpose. MS Graph SDK is a class library with ready to use code for interacting with MS Graph API. It’s freely available as a NuGet package and can be easily added to your project from Visual Studio NuGet package manager. Read more about MS Graph SDK in my article here. Once you have created a new project, you need to configure it so that authentication using Microsoft account (your Office 365 developer account) can be done in your application and you can receive a token required to access data using MS Graph API. For that you need to go to Microsoft App Registration Portal. Please note these steps of registering your application are explained in detail in my articles here and here. Open Microsoft App Registration Portal located at https://apps.dev.microsoft.com and login with your Office 365 developer account. Alternatively, you can also click on “Let us help you get started” checkbox and the wizard will guide you step by step. Why we use “Native Application”? Because we are writing code for a console application which is going to run on Windows OS. If it was a web application, then you would select “Web” and similarly “Web API” for an API. You don’t need to make any more changes in MS App Registration Portal. Click on “Save” button at the bottom of the page. Back to VS 2017 now. We need to configure our application with the application id we just created. Simply search for “Microsoft Graph” in package manager and add “Microsoft.Graph” and “Microsoft.Graph.Core” packages. Also add “Microsoft.Identity.Client” package as it’s required for authentication code. Need more detailed steps? Read “Adding MS Graph SDK to your C# application” section of my article on MS Graph SDK here. In the following section, I will explain you how to write simple code which calls MS Graph API to fetch logged in user’s details. I will also explain code required to authenticate user using Microsoft account. Note here the most important code is clientApp.AcquireTokenAsync(Scopes) which will redirect user to Microsoft login page, show consent for permission(s) required by your application for given Scopes. I have attached the whole project with this article. You can download it and view/run. Please note that this code is not suitable to be used in production application. Now you are ready to run the application. Press F5. Note that we did not write any code to show this popup. It is handled by Microsoft Identity package; your application will never get user name and password. Remember in above code, I have written “User.Read” in “Scopes”? That’s why user is shown that this application wants to “View your basic profile”. Click “Accept” to continue. Hurray! You will be shown logged in user’s display name! That’s it for this article. The purpose of this article was to make you aware how you can write simple most program to connect to Office 365 using MS Graph API and fetch some data. For more detailed code and some samples, I suggest you visit MS Graph API samples page on GitHub here. Please note that some repositories are good to be used in your production application as well. For more on MS Graph API, read my articles here. What is Microsoft Graph SDK? This article is a quick overview of MS Graph SDK. Using MS Graph SDK, you can easily write code which calls MS Graph APIs to interact with Office 365 data. In a nutshell, MS Graph API gives you a single REST API endpoint which you can call to interact with “almost anything” in Office 365. To know more about MS Graph API, read my article here. What is MS Graph SDK? Using MS Graph SDK, you can quickly integrate MS Graph API in your application, so that you don’t have to write everything to deal with MS Graph API from scratch. It provides ready-made classes and methods to be used while making Graph API calls. Please note that using MS Graph SDK is not “mandatory” if you want to code your application for MS Graph API. It just makes coding quick and easy. MS Graph SDK is available for most leading development platforms e.g. ASP.Net, Xamarin, Android, iOS, JS, Angular, and many more. Day by day more platforms are being added. Let’s add MS Graph SDK for .NET i.e. MS Graph NuGet packages to a C# application. Quickly create a new C# application (either console app or web app) in Visual Studio 2015/2017. Note here that it will also install “Microsoft.Graph.Core” package, among others, as one of its dependencies. Click on “I Accept” button. Output window will show success message once installation is finished. You have successfully added MS Graph SDK packages to your application. You can make sure that by two ways. You will also need to install “Microsoft.Identity.Client” package as it’s required for authentication code because users are authenticated against Microsoft account. Don’t forget to select “Include prerelease” checkbox! That’s it! You have now successfully added MS Graph SDK and you are ready to start your coding. To know how to write code to fetch Office 365 data using MS Graph SDK, read my article “Write your first program using Microsoft Graph SDK” here. Author Nilesh ShahPosted on April 11, 2018 April 11, 2018 Categories MS Graph API, Office 365, ProgrammingTags Graph API, Microsoft Graph, Microsoft Graph API, Microsoft Graph SDK, Microsoft Graph Software Development Kit, MS Graph, MS Graph API, MS Graph SDK3 Comments on What is Microsoft Graph SDK? In this article, I will introduce you to the MS Graph API which is a powerful way to interact with Office 365 data. How it came into picture? What are its features, benefits and limitations? Let’s start with MS Graph API. Prior to MS Graph API, Microsoft had different APIs for it’s different Office 365 and cloud products. Outlook, OneDrive, OneNote, Yammer all had their different APIs to interact with them. It made a developer’s life difficult if one had to connect to many different APIs in an application. As a solution, Microsoft launched the MS Graph API which is also called “One endpoint to rule them all”. Why should you learn MS Graph API? Office 365 is undoubtedly most widely used office produce worldwide. Millions of people are using the commercial versions of Office 365 suite or one or another of its products like Outlook, OneNote, etc. On an average, a user in any office will use 2-3 hours working on different Office suite product like Outlook, Excel, Project, etc. Millions of new emails, events, etc. are generated in Outlook and millions of files are stored on OneDrive. If you want to access all this information stored in Office 365 or on Azure, then you need MS Graph API. MS Graph API is the easiest way to interact with Office 365 data. Using MS Graph API, you can get mostly everything from a single endpoint https://graph.microsoft.com. It liberates a developer from calling different Office 365 APIs and doing multiple token management. The entities of Office 365 are accessible in a logical way thru MS Graph API. Look again at the picture posted at the top of this article. You will see that once you access a user, all other entities related to it – files, messages, notes, etc. – are then accessible in a logical manner. You don’t have to remember how an entity will be accessed, it follows a logical manner of graph structure. MS Graph API does not introduce any new authentication mechanism where users have to go to register and then remember one more user name and password. Instead, MS Graph API uses the Microsoft identity stack (which is used by 85% of fortune 500) – means that your users can login using the same familiar Azure AD / Microsoft Office 365 login credentials in your application. MS Graph API uses Open ID Connect for authentication and OAUTH 2.0 for access tokens. ODATA – MS Graph API supports open data protocol v4.0 which is also called “The best way to REST”. It uses URL query string operators to make simple, standard and readable expressions. Using webhooks, MS Graph API can send you notification for any changes in entities for which you have subscribed to. Instead of keeping on querying MS Graph API to see if there are any changes, you can use webhooks mechanism to have notification sent to you in case of any action/event happening. For example, you can subscribe to get notified when a new message arrives. MS Graph API does not only do simple input and output operations on your organization’s Office 365 entities. Instead of that, MS Graph API also has intelligence inbuilt in it which can help you to find treading documents around a user, people frequently contacted, etc. It can also help you find the best meeting times in a team. 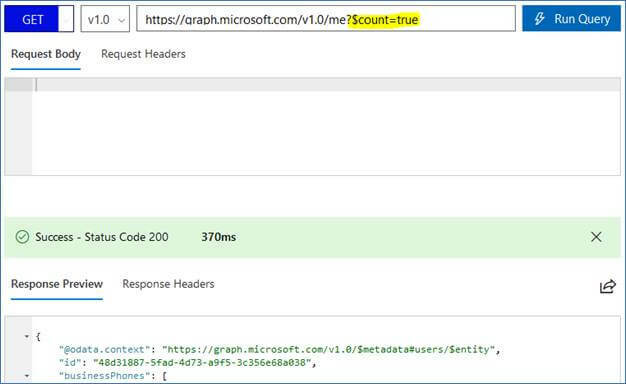 You can extend MS Graph API results with custom data i.e. you can add custom data to MS Graph without using any external data source. This is helpful when you want to store some custom data relevant to your application e.g. profile setting or favorite theme, etc. There are two types of extensions: Open extensions which are flexible and allows you to store any untyped data; and Schema extensions where you can define your own complex strongly typed schema, which can be shared between your different applications. Using delta query, it become easier to track data changes in entities. Instead of getting list of all entities and comparing them one by one to identify any changes, just fire a call using delta query which will give you only the changes i.e. inserted, updated, deleted data since your last call. Using MS Graph API’s JSON Batching you can combine multiple requests in one HTTP call and optimize application performance. Instead of looping thru multiple calls in your application, you can fire all related / unrelated calls in one batch in one go. The most visible one is some of its features are still in beta, but MS Graph team keeps launching new features in live regularly. For a list of all MS Graph API known issues, refer here. MS Graph API Explorer is a great tool to get started with MS Graph API and learn first-hand how it works. Graph Explorer is a developer sandbox where you can fire actual Graph API call and see its result. You can access MS Graph API Explorer here. MS Graph team has done some great work in launching SDKs for different platforms which makes development with MS Graph API easy. You don’t have to code everything from scratch, ready to start code is available in SDK. If you are a java developer, then recently Microsoft has launched Java SDK for MS Graph API in preview. That’s it for introduction to MS Graph API in this article. Wait for my next article where I will show how you can start programming in MS Graph API. In this article, I will continue showing how to execute the calls to Microsoft Graph API using some optional OData query parameters. The part-1 of this article series can be found here. I suggest you read it first, as this article continues from where I stopped in part -1. Let’s now see the remaining query parameters one by one. When you fire an API call to MS Graph, it will return the JSON result with all the properties. You may not need all the properties of a result set always. When you want MS Graph API to return only certain properties, then use $select parameter to specify which properties you want in result set. Please note that the no. of records in the result will not be affected with or without $select parameter, only what’s returned for each record in result will change. Out of all these properties, what may be most important for you if you wanted to show the user his/her files from OneDrive? Of course, the name of the file/folder. You can also use more than one property separated by comma, e.g. If you type in the property that does not exist in the result set, then it will be ignored. Using $search query parameter, you can specify free text search criteria for items being returned in result set. Please note that this parameter is currently supported for only “messages” and “person” entities. Microsoft Graph team will cover more entities later. Some programmers are confused between $search and $filter parameters, because both do similar operations. I will explain the difference briefly in the next section for $filter. When you specify $search parameter, it tells MS Graph API to include only those entities in result which match the specified expression. Here what to match is left for the implementer, OData specification does not mandate anything. Hence when you specify search criteria with $search query parameter, the result will be dependent on what MS Graph API team has decided to implement. Mostly it works as free text search. Let’s say you want to find out emails which has “brainstorming” mentioned somewhere. Graph API will match the word brainstorming in an email’s from, subject and body fields, and will show the matching messages in the result. Let’s see another example of using $search with “people” entity. 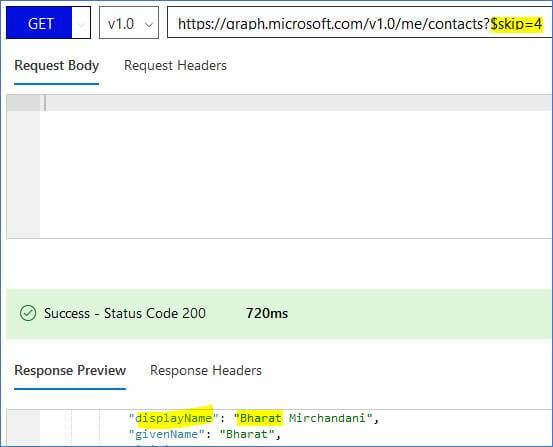 MS Graph API will search for the people related to the sample account user, will search for “langer” in display name or email, and will return matching records in result. There are many more possible calls using the $search parameter, but I will restrict to there two calls only for brevity. I encourage you to explore more by yourself. With $filter parameter, you can specify the filter criteria on a result set using logical operators or string functions. There are fixed logical and string operations which can be performed on a result set using $filter function. The $filter system query option allows clients to filter a collection of resources that are addressed by a request URL. The expression specified with $filter is evaluated for each resource in the collection, and only items where the expression evaluates to true are included in the response. $search starts with an empty result set and adds items to it based on criteria that match, while $filter takes full result set, and removes items based on criteria that don’t match. $search operates like a free text search, while $filter works on predefined logical and string functions. Which logical and string functions are supported with $filter? Let’s see some examples of how you can use $filter parameter. There are many more uses of $filter parameter possible, but I will restrict to only two examples for brevity. I suggest you read more on Microsoft Graph API documentation page here. When a response from MS Graph API does not contain all the available records (due to user explicitly specifying to select only some top records or due to server-side paging implemented in Graph API to limit response size), then you will see the response contains a server generated value with $skipToken parameter. This value is to be specified in the next call to MS Graph API so that it will return the next set of records. The value of $skipToken is generated by server, it can not be specified by you as a consumer. The @odata.nextLink property contains the call which should be fired to get the next set of result. For identifying what should be returned, it has a skip token generated from server-side with some logic to skip those records in current response. Simply fire the query mentioned in the @odata.nextLink property, and you will get next set of values. In your programming, you can use $skipToken to get paginated data (implement paging). Not all query parameters are supported for all entities. Always refer to latest Microsoft documentation for what’s supported. I also suggest firing the call in MS Graph Explorer first and see if you are getting the expected result or not, before starting any programming and later having any surprise. If you include some query parameter for a non-supported entity, then MS Graph API will throw appropriate error. 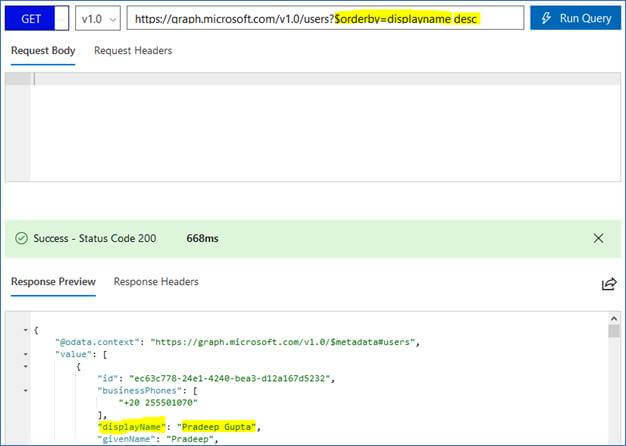 With beta version of MS Graph API, using “$” prefix before a query parameter is optional. Note that the “top” query parameter is used without any “$” prefix here and still you get only 2 records in result. This concludes my 2-part article series on MS Graph API query parameters. I hope you enjoyed learning about how to use query parameters in the MS Graph API call. I suggest you keep reading more about MS Graph API until my next article. You can read some of my articles on MS Graph API here. This article may be published by me on other websites too. In this article, I will explain how to execute the calls to Microsoft Graph API using some optional OData query parameters. What are the optional OData query parameters? While Microsoft already has the documentation to cover all its technology, in this article, I will try to explain these OData query parameters with some different angles and usage scenarios. I’m sure you will enjoy reading this article and learn something new. In my previous articles, I explained the different components of Microsoft Graph Explorer and showed how to execute MS Graph API calls using the sample account. I suggest you read those articles too for better understanding MS Graph API Explorer. What are the Optional Query Parameters? 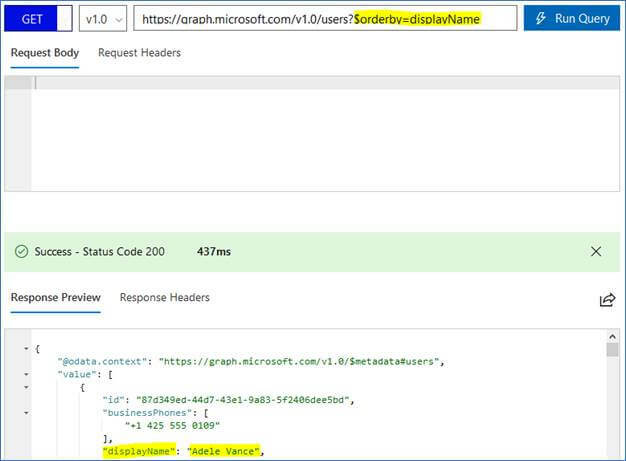 The current version of Microsoft Graph API supports the OData version 4.0 standard. This OData standard defines how the data is exchanged between the originator and the consumer of the REST APIs. Here “query-parameters” is an optional set of parameters to modify the response/output of API calls. It always starts with $ sign. (Please note here that in the beta version of MS Graph API, using $ is now optional. We will see that later in the article). Query parameters start after “?” sign. The OData standards specification on www.odata.org defines the optional query parameters as “System Query Options” which are explained in great detail here. “System Query Options are query string parameters a client may specify to control the amount and order of the data that an OData service returns for the resource identified by the URI. The names of all System Query Options are prefixed with a “$” character. In short, using these optional query parameters in the API endpoint query string you can define the criteria applicable on the result. And these parameters are optional meaning if you don’t mention any of them in the query string, then also the API call works fine. If you are not aware of OData standard, then I suggest you to spend some time on reading about the OData specification on the odata.org website here for better understanding of OData concepts. A complete list with details can be found on Microsoft Graph API documentation website here. Let’s now see each of the above query parameters one by one in detail and fire queries in Microsoft Graph API Explorer. I will explain them in increasing order of complexity of understanding. This parameter will fetch only certain number of data items as specified along with $top. At times, you will not need to fetch all the items from the result set, but only first few of them. In this case, $top query parameter is used to specify how many items should be returned in the result. Usually, $top query parameter is used with $orderby query parameter (Read more about $orderby in section 3 below). Notice the amount of data being returned in results in the above calls. In real life API call execution, it will return the current user’s emails and all files on his/her OneDrive. This may not be required always, and returning these many items may not be best suited option performance-wise too. When you want to see only some limited number of records, at that time you can use $top. 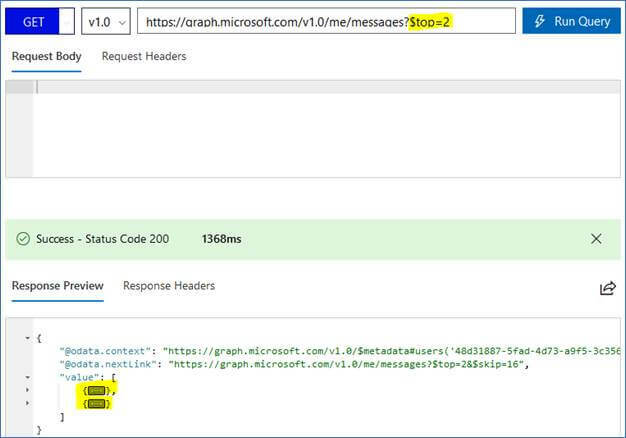 https://graph.microsoft.com/v1.0/me/messages?$top=2 or click here, then press “Run Query”. Note: I have collapsed the JSON result in above screenshot to show items fit in one screen. This parameter will fetch the total number/count of data items in the specified API endpoint along with the result. Note that the API call will return the result “as it is” without this query parameter, but if this parameter is specified, then in addition to the result, a number indicating the result count is also returned. You will see the result count in @odata.count property in response JSON. 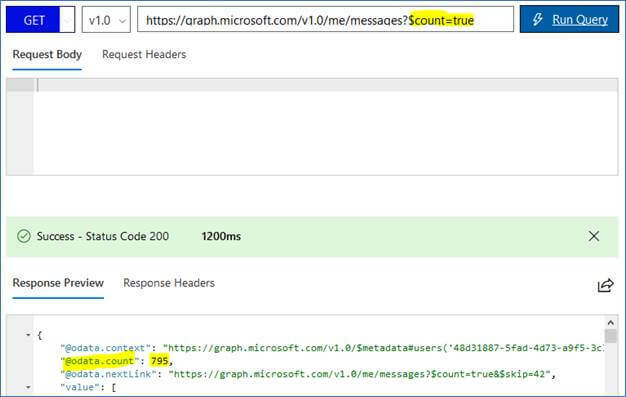 Notice here as highlighted in above screenshot, MS Graph API will return to you the count of emails as the value of property @odata.count. You will see MS Graph Explorer does not return any count or does not return any error, it simply returns a valid result. If the $count parameter is not applicable on the API endpoint it will ignore it. I leave it to you now to try and explore the $count parameter with different Graph API calls. This parameter will make the Graph API return the result in a specific sorting order. Sometimes, you will want your result from MS Graph API to be sorted in a certain order depending on the date or name or some other property of the resource being returned. Use $orderby parameter in those cases to get your result sorted in certain order. Open MS Graph Explorer here and fire following call to get all users. 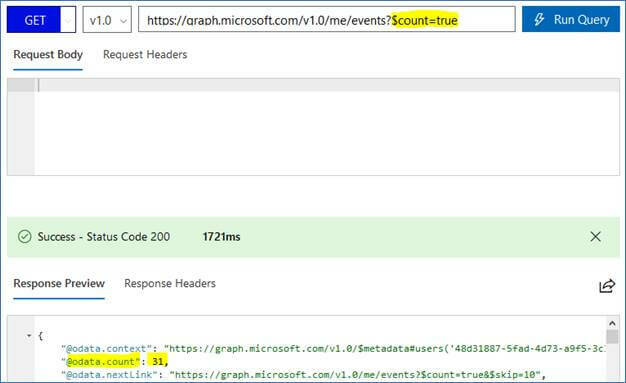 https://graph.microsoft.com/v1.0/users or click here, then press “Run Query”. You will see all the organization’s users are returned here. They are in the order of email address. You may want to have the result ordered by another property, let’s say display name. Note: In above screenshot only one result fits in the screen. Try scrolling the response view by yourself to see all the items. The default order by is done in ascending order. If you want to order by descending order, then specify “desc” in the URL separated by a space. This query parameter tells the MS Graph API to omit the number of records as specified along with $skip from the result set. MS Graph API will follow the same sorting order it follows (if $orderby is not specified) and will omit that many number of records from the result as specified in the query string. It will show the result with all contacts of sample account. Note the result’s “displayName” values for first 4 records (they start with “A”). MS Graph API has omitted first 4 records from the result set. What happens when we specify a skip count greater than no. of records in the result? Let’s find out. We will see the rest of the parameters in next article. Until then you can go to MS Graph Explorer and try the above examples by yourself. You can also read more of my MS Graph API articles here. This article was first published by me on C# Corner Website here. In this article, I will show how you can display Office 365 data of your organization in Power BI report using MS Graph API. I will show how you can fetch your organization’s users with MS Graph API, and quickly create a report using Power BI Desktop. Once you learn to use MS Graph API in Power BI, you can explore more options to create some interesting reports on your own. This article assumes you know something about MS Graph API and Power BI. There is no coding involved to follow steps of this article. However, if you want to follow along the steps, then you will need things mentioned in “Prerequisites” section. If you don’t want to follow along and just want to read, you can jump to “Getting Started” section. You may have access to Office 365 thru your employer/organization account. However, it is strongly advised that you don’t use your live/organization account to follow steps of this article. Instead, use Office 365 developer account. You will need Power BI Desktop to create the report which will consume MS Graph API data. I assume you have Office 365 developer account and you have installed Power BI Desktop on your PC. Click on “Get Data” just below Power BI Desktop header on top left. Once you click on OK, you will see a dialog where you can specify your credentials to connect to MS Graph API. Once Power BI fetches the users using MS Graph API, it will show you in a dialog. For testing purpose, I have created some users using my developer account. I suggest you also create some test users in your Office 365 developer account using Office 365 Portal. You should also see your organization’s users here. Click on “Load” to continue. 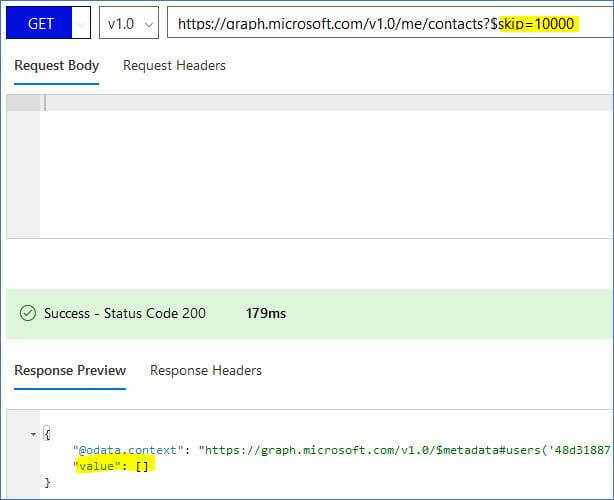 Power BI Desktop has received the JSON data from MS Graph API in response to the call to https://graph.microsoft.com/v1.0/users endpoint, and converted it to a data table for you. What you see under the Fields -> Query1 section is the list of all properties it got from MS Graph API. Now we have the data we want from MS Graph API loaded into Power BI. Let’s create a report using it. Hurray, you have created your first Power BI report using MS Graph API! The purpose of this article was only to show you how MS Graph API data can be consumed in Power BI, which I have shown above. Similarly, you can try by yourself creating some other reports/visualizations and calling some more MS Graph API endpoints. But this requires a Power BI account and it’s out of scope for this article. I suggest trying it on your own.